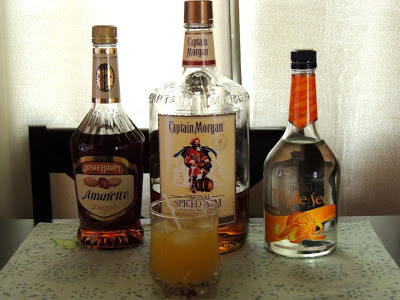 Desperate for the perfect Mai Tai to recall my lazy days at the beach on Maui, I made one delicious change to my original recipe. This new and improved recipe tastes closer to what I remember from the islands, and it's going to be my go-to drink while floating in the pool this summer. You can get the ingredients pretty inexpensively. For the price of a few resort-priced cocktails, you'll have enough ingredients for an epic backyard luau. "Ono" means "delicious" in Hawaiian, so I've named this version of my Mai Tai recipe after my thoughts upon first sip. Fill a tall glass with ice. Mix the first 4 ingredients and pour over ice. Float the Captain Morgans on top. The glass pictured to the right contains half a serving of the recipe above. For first taste, I split the recipe in two small glasses, one for me and one for my husband. He particularly loves amaretto liqueur, so he was definitely a fan of this drink. I used fresh squeezed orange juice from the orange tree in our backyard. The oranges weren't quite as sweet as I would like, so I added a little Splenda to compensate. You can use your favorite store-bought orange juice which shouldn't need any additional sweetening. I used Dole pineapple juice. I saw a bartender using this exact same juice at a bar on Maui, so I don't think it gets more authentic than this. Although, if you happen to be cutting up a fresh pineapple, you could always use the fresh juice.